Bitten by the fountain pen and ink bug, I'm fighting my addiction by blogging about it! Ah, Noodler's Fox Red, an ink that I wanted to test for a very long time. Its turn has finally come. Being a red ink, I didn't have much use for it, except in my red fountain pen that I use at work. I use red mostly to underline stuff and make small notes so it takes a long time before I exhaust the pen's supply. As usual, I use yet another Pilot Varsity for my red inks. I didn't buy a full bottle of Fox, but merely a sample. It's just as well, because this ink is expensive. What makes it so special though? Read on to find out. Fox Red is one of the few (and exclusive) inks that come in Noodler's dainty little 1oz (30ml) bottles. The bottle itself costs the same as a 3oz bottle, $13.50, which actually makes it 3 times more expensive than one of Noodler's regular inks, at $0.45 per milliliter. Nathan Tardiff, Noodler's creator and owner, opted for this solution to keep the ink relatively affordable. But why is this ink so expensive? I tested another ink in this series, Hunter Green, but there's also La Reine Mauve, Luxury Blue, Periwinkle and Whiteness of the Whale. The simple answer is that the components which go into these inks are very expensive. I don't doubt that for a minute because Noodler's is known for its wide range of inexpensive inks but sometimes there are exceptions. Fox Red has a very... foxy color. Forgive the pun but it is rather deceiving. I wouldn't call it a pure red by any stretch of the imagination. Instead, it is warm, tending a bit towards orange. Overall it feels a bit vermilion if you ask me. In the writing sample I compared it to Noodler's Nikita (of which I own a bottle). The two inks are very different, both in shade and in their properties. While Nikita is red-pink, Fox is red-orange. Noodler's Fox Red doesn't have any shading. It is a flat color. Incidentally, the liquid is milky and rather opaque. I haven't noticed any feathering. It ghosts strongly on cheap paper (but not on Rhodia) but it doesn't yet bleed through. Both sides of the paper remain usable. With the dip pen it bleeds copiously but then again, most inks do. Noodler's Fox Red flows well in the Pilot Varsity. I would easily give it a 6/10. On the other hand, it feels just a tiny bit dry. It's hard to describe exactly but to me it seems that the chalky nature of this ink has something to do with this. It still writes very well but it doesn't glide as well as, say, Bad Blue Heron that impressed me so much. Drying times are brisk on both Rhodia 80g and photocopy. While on Rhodia is requires just a little over 10 seconds, on photocopy it is dry within 5 seconds. I saved the best for last. 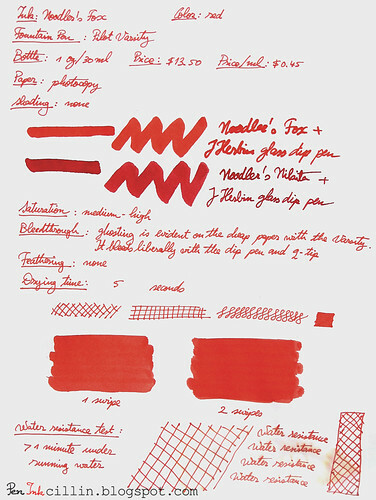 I didn't breathe a word about this until now but Noodler's Fox is a water resistant red ink. While this may not seem very special, consider the fact that there aren't many waterproof red inks out there. In fact, there isn't another I can think of off the top of my head. This, alone, may be what makes Noodler's Fox so special, and may also provide an answer as to why it costs so much. As you can see from the sample, the water resistance is exemplary. But wait, there's more! Noodler's Fox is also forgery resistant, which means that you can use it to write important and/or official documents. Taken separately, none of Noodler's Fox's features stands out. But together, it makes for a very compelling package. While it behaves well in most aspects, the most important feature is its water resistance. I don't know of another red ink that is also forgery resistant to boot. If you do, please drop me a line. If this is a definite requirement for your red ink, Noodler's Fox is a buy. If you can live without water resistance, there are other, much cheaper, inks out there. Then again, even if you buy it purely for its color, you can't go wrong with Noodler's Fox. Following are two writing samples on photocopy and Rhodia 80g paper, respectively. Thanks for the review. I had not seen this color before and like its warm red-orange look. As for the water resistance and forgery proof aspects, I think I would find those more practical in a blue, black, gray, or brown ink, though if dealing with ledger entries, those characteristics would be quite useful in red. Sure, that's what I thought, who needs red waterproof ink?? But if you do need it, here it is. Great review - you really captured it well! I love this ink. 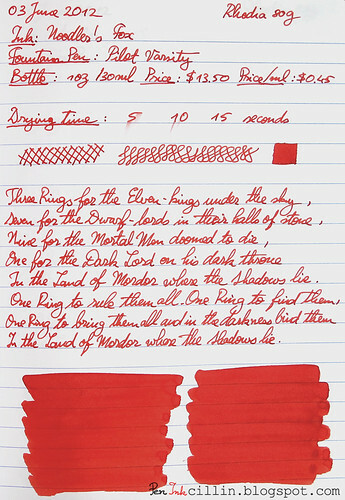 I bought it several years ago (back before I knew anything about fountain pens/inks) because I just wanted a red ink. Silly me. Now I'm almost out and I was looking at getting more and realized the teeny bottle is so $$$! At least now I know why! Thanks! I believe this is one of my most accurate representations of the ink (photography-wise). It's incredibly hard to make these inks look realistic on a screen. The problem is that each screen is calibrated differently (or rather most screens aren't calibrated). I, for example, have 2 screens. One is high quality and represents colors more faithfully, while the other is cheaper and makes a mess of things. I try to find a balance between the two but mostly rely on the better screen. Your reviews are always so thorough. Would you be interested in reviewing a JetPens product? We'd love to feed your addiction. Please email us at jetpromos [at] jetpens [dot] com! Pen Pursuit - The Search For the Perfect Pen!